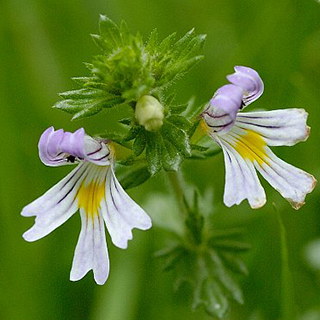 Eyebright may have gained its name from its flowers, thought to resemble the human eye. More probably, experience taught that the herb was good for the eyes, hence the name. Although little researched, it contains constituents known to have a tonic effect on mucous membranes, including those of the eyes. An infusion of 1 oz. (28 g) of the herb to a pint (500 ml) of boiling water can be used and the eyes bathed three or four times a day. When there is much pain, it is considered desirable to use a warm infusion rather more frequently for inflamed eyes till the pain is removed. In ordinary cases, the cold application is found sufficient. 3–7.5ml a day, or max. 50ml (2 oz) per week of a 1:3 tincture for allergies. The Eyebright will not grow readily in a garden if transplanted, unless 'protected' apparently, by grass. The reason for this is that it is a semi-parasite, relying for part of its nourishment on the roots of other plants. Sow seeds in autumn to allow 90 days of chilling. Eyebright requires a period of chilling to break dormancy and trigger germination in spring. Euphrasia is best collected in July and August, when in full flower and the foliage in the best condition. A fluid extract is prepared from the plant in the fresh state, gathered when in flower, and cut off just above the root.